One episode of Minder has never been shown on national television. 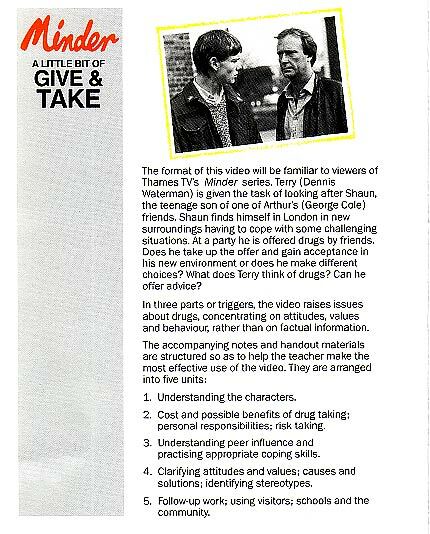 Produced in 1986 and just 28 minutes long, A Little Bit Of Give & Take was a one-off production for British school children to learn about the dangers of taking drugs. This episode was sent to schools and health authorities as part of a video package called DOUBLE TAKE. The theme of this episode covers how young people might react to situations when they are offered drugs and how they might cope with overcoming this. Although Terry & Arthur feature throughout this episode there is only one short scene where they appear together. This was due to the availabilty of George Cole and Dennis Waterman around the time of filming. There is also a short scene at the Winchester Club with Glynn Edwards as Dave. The package (similar in size to a spoken word book, though thicker) contained a VHS or BETAMAX tape, various teaching materials including a 25 page script to the episode, a poster with stills (also from the episode) - this includes one of Terry with his boxing gloves on and many activity sheets with poor illustrations of the cast. The story which is split into three parts, centres around vulnerable teenager Shaun Barker. Shaun comes to London as his parents can no longer look after him. Teenager Shaun, arrives in London looking for his aunt and uncle only to find them away. Shaun's cousin Tim is not interested in him. Shaun then looks for Arthur Daley, an old friend of his father looking for somewhere to stay. Arthur lumbers Terry with Shaun while Arthur goes off on holiday with er' indoors to Jesolo (which Arthur refers to as the 'Oyster of the Adriatic'). Terry chats with Shaun about the dangers of drugs and about choice. Terry drops Shaun off at a party organised by Shaun's cousin. The whole of part two is set at the party and features obvious messages and scenarios involving drugs and alcohol. Arthur's back from holiday and chats to Dave about his latest business deal - the acquisition of antique ceramics from Shaun's cousin which turns out to be stolen merchandise to fuel Tim's drug habit. Terry speaks to Arthur who has second thoughts about fuelling a habit. There are more obvious messages about the dangers of drugs here, including a more shocking scene as the youngsters watch a video of this at Tim's house. There are some subtle differences in this one-off production. The episode shows Arthur wearing a cream/beige suit with matching hat, only ever seen in #6.7 'Minder On The Orient Express'. The location of the Winchester Club and Terry's flat are also different. The episode was obviously produced on a lower than normal budget compared to broadcast Minder episodes. When minder.org spoke to former actor Leigh Martin Gotch about this episode, he had no idea that this was an episode of Minder as he had never appeared in any scenes with George Cole and Dennis Waterman. In the opening titles to this episode both his name and Glynn Edwards name are misspelt. The episode starred young actor Christoper Routh (pictured here with Dennis Waterman), who was happy to talk to minder.org about the episode and its production back in 2004. You can read the Christopher Routh Interview here. A sample of some of the material contained within the schools pack is shown here, though you can download more excerpts, including parts of the script, activity sheets (including interesting portraits of Arthur and Terry) for sampling only by clicking here (1.08Mb zip file). 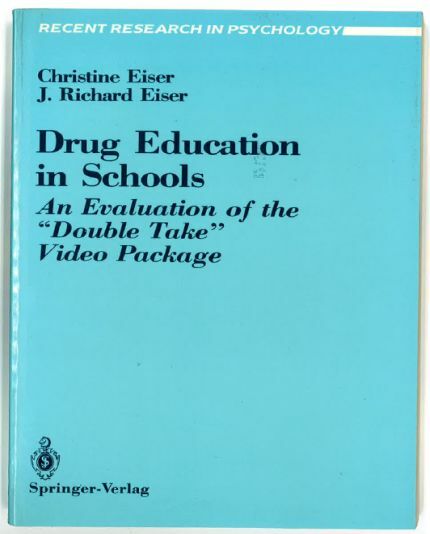 In 1988, Christine Eiser and J. Richard Eiser from the Department of Psychology at Exeter University, released a book investigating how successful the anti-drugs campaign had been entitled 'Drug Education In Schools - An Evaluation of the "Double Take" video package ISBN 0-387-96792-3/ISBN 3-540-96792-3, shown here on the right - including trials in schools of how successful this campaign had been. Although this episode has never been broadcast on television, it finally saw the light of day in 2006, when it featured as part of the series 6 DVD release of the Minder series by Umbrella Entertainment in Australia. Apart from its original VHS and Betamax release to schools in 1986, it was officially unavailable until 2006. Original video packs have now become quite rare but the episode has appeared on YouTube in recent years. On 26th November 1985 ITN broadcast a short feature on the making of the episode, which is publicly available for viewing on the itnsource site.